Florida recipients of Temporary Protected Status are in Washington, D.C.
"They are looking for a path to citizenship," said Isabel Sousa-Rodriguez, the membership director with the Florida Immigrant Coalition. "They're concerned about losing everything they've worked to build and everything they've contributed." The TPS protection was created more than two decades ago to protect immigrants fleeing humanitarian disasters in their home countries. 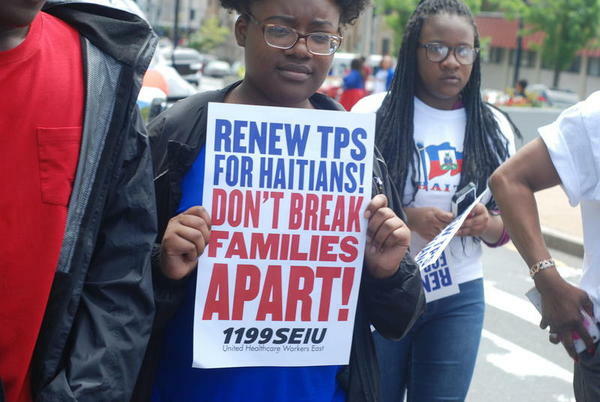 Recipients have called for an extension of TPS, citing continued instability. But the Trump administration said the program is no longer necessary because conditions in Haiti, Nicaragua, El Salvador and Honduras have stabilized. The program currently protects some 300,000 immigrants from those countries. Now families are facing a decision of whether to return to their home countries or remain in the U.S. illegally and risk deportation. Sousa-Rodriguez said five TPS recipients from Florida—including one from Miami—are joining dozens more from across the country to lobby Congress this week. They will continue the trips throughout the rest of the year. One of the goals, Sousa-Rodriguez said, is to advocate for the passage of the American Promise Act. The bill, sponsored by Rep. Nydia Velazques of New York, would let TPS recipients apply for lawful permanent resident status. Sousa-Rodriguez added that the TPS delegation wants to "humanize the issue." "We're trying to increase visibility of TPS communities. We want people to understand who TPS holders are, what they're living through and their goals and dreams in this country," Sousa-Rodriguez said.